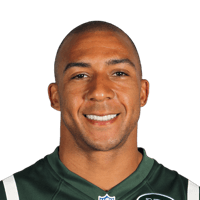 Published: Oct. 7, 2013 at 10:57 p.m.
New York Jets quarterback Geno Smith finds tight end Kellen Winslow for a 1-yard touchdown. Published: Sept. 9, 2013 at 07:36 a.m.
(:39) G.Smith pass short middle to K.Winslow for 7 yards, TOUCHDOWN. Published: Sept. 8, 2013 at 02:56 p.m.
New York Jets rookie quarterback Geno Smith has first NFL touchdown with a 7-yard pass to tight end Kellen Winslow.